The Ready To Use Patching Material For Cracked & Alligatored Pavement Areas. Coverage is dependent upon depth and width of cracks. Typically, one gallon of crack filling material will fill approximately 75-150 feet of cracks. 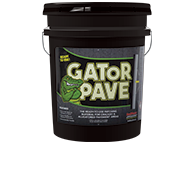 GatorPave™ is a trowelable patching material that is ideal for repairing alligatored areas in asphalt surfaces, as well as cracks in excess of 1/4″ wide. Stir material. Use as is. DO NOT DILUTE. Alligatored Areas: Apply by squeegee or trowel. Sand may be sprinkled over GatorPave™ to promote adhesion of pavement sealer. Cracks: Fill cracks with trowel or U-shaped squeegee.